Our favorite fictional characters from books and movies often display an impressive and wide range of psychological attributes, both positive and negative. We admire their resilience, courage, humanity, or justice, and we are intrigued by other characters who show signs of personality disorders and mental illness — psychopathy, narcissism, antisocial personality, paranoia, bipolar disorder, and schizophrenia, among many other conditions. This book examines the psychological attributes and motivations of 100 fascinating characters that include examples of both accurate and misleading depictions of psychological traits and conditions, enabling readers to distinguish realistic from inaccurate depictions of human behavior. 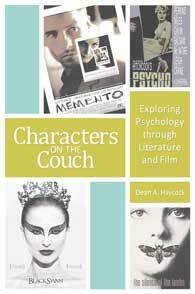 I am very interested in your forthcoming book,Characters on the Couch: Exploring Psychology through Literature and Film. As I am doing related research, I have submitted proposal a manuscript to ABC-CLIO/Greenwood on mental illness and 21st century young adult literature, aimed at high school teachers and college English Educators who work with them (which is my own focus as a Professor of English-Secondary Education at Northern Michigan University). I am wondering with which editor you are working at ABC-Clio/Greenwood and whether you have any advice for me regarding the publishing process with that particular editor or with ABC-Clio/Greenwood in general. Thank you for your help. I’m looking forward to reading your book next month!